You can have one too! Contact us now for a demo. 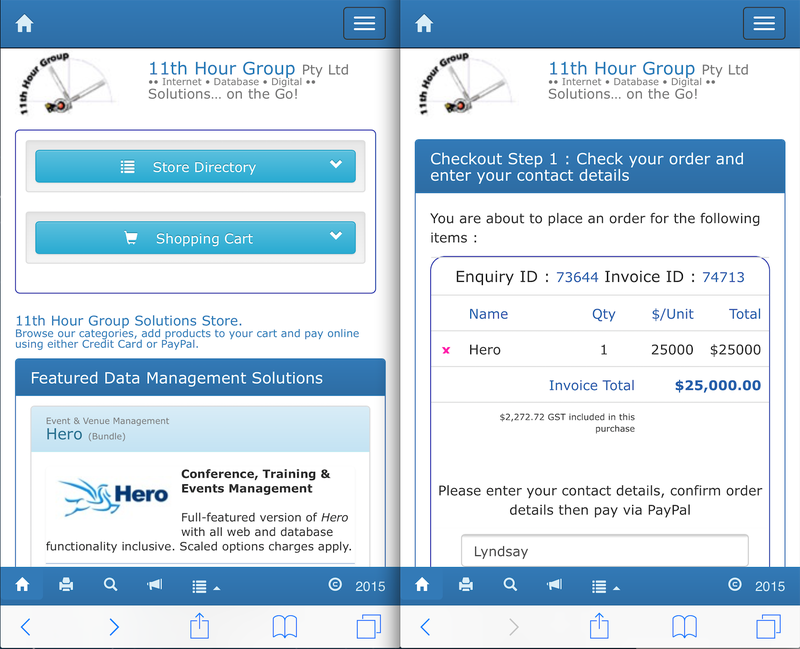 FileMaker™ Go on iOS platform with Apple™ iPad or iPhone devices has revolutionised mobile computing. 11hrg build databases as stand-alone apps and we optimise access to hosted databases for remote connection from the device. We have a range of Demo's available so you can trial our products or see examples of our prior work and web features we can offer eg. Our Support Centre will take advantage of our 11th Hour Group YouTube Channel to give guided tours, database-module lesson content and technical demonstrations. 11th Hour Group website and store – powered by Hero – have been undergoing a make-over. We have a new Responsive Design to cater for the huge array of mobile devices... all with different screen dimensions and changing orientations. We have also streamlined and simplified the whole interface with now 85% of the content being dynamically generated by values entered into the Hero database. The shopping experience is straightforward and will remain in Demo-mode for the time-being for testing purposes. If you have a PayPal Sandbox account, feel free to complete your order and receive email confirmation and invoices. If you don’t, fill in the contact form and ask us for an account and password to use for your testing. Hero is a comprehensive event and training management system. Find out more about most of Hero’s features at hero.11hrg.com.au or checkout Hero in the Store Directory. 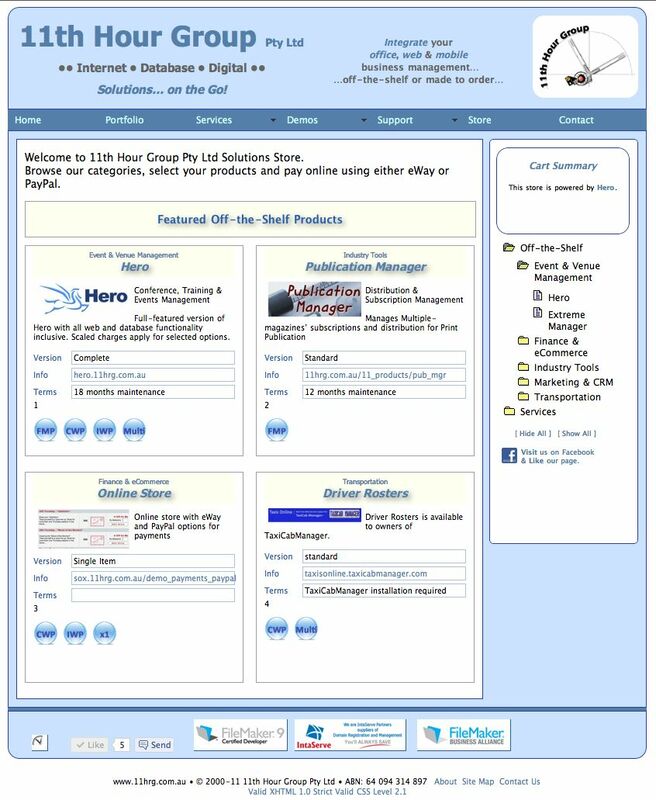 As well as the store, Hero has a number of other web-accessible web-portals. We have email campaign management, surveys, bookings and much more. 11th Hour Group have a new web site. We now have a store (in demo mode to begin with) and the entire site is managed by our Hero database. The old web site was built as a CSS challenge in about 2002... and has served us now for many years. Our new site will endeavour to be a demonstration of the power of FileMaker in your business. 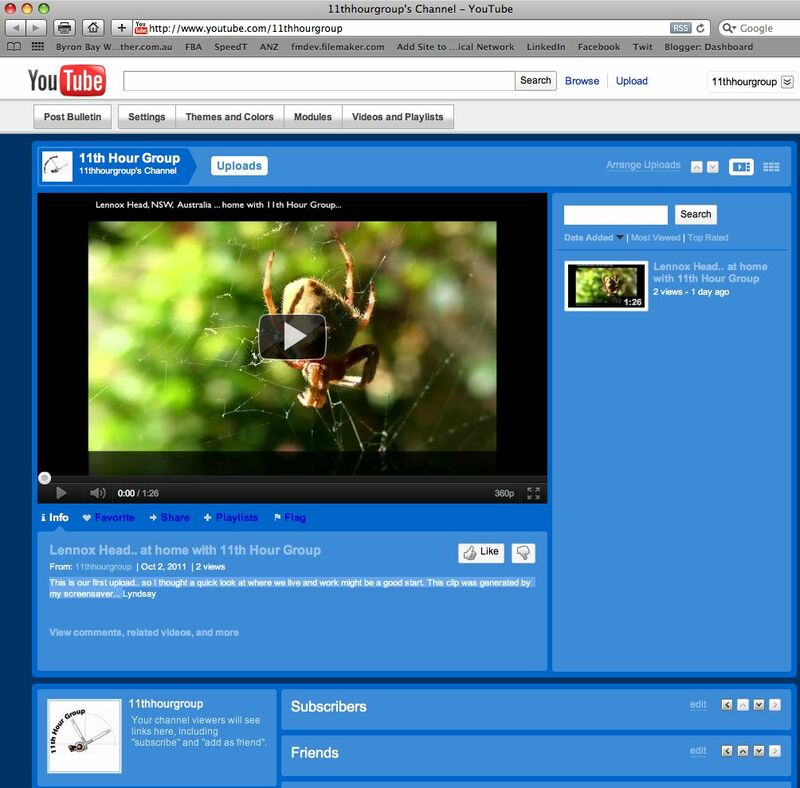 11th Hour Group have set up a YouTube Channel and uploaded our first Video. As this is our first upload, I thought a quick look at where we live and work would be a good start. The clip was generated from my screensaver. Check it out and subscribe to our channel. We work closely with other FileMaker professionals to provide value-added web interfaces to their products or client work and also have a vast array of web interfaces we have built for our own clients. Our Servers provide quality hosting for web-based traffic and we also provide quality remote-support for hosting in your offices. Our Digital Division has opened up new services in the areas of Audio Engineering, Mastering, Production and Live Sound. Our Media Division has also been revitalised and expanded it's services. Our consultants can assist with planning through to production through to evaluation phases for your media project. Film, animation, photography, content development and media management and analysis are just some of the new or expanded services we offer.